As we now know everything actually worked and I am now officially back on the blog. The only problem is that I am now gw3058 instead of Greg, Capt Greg , or any of the other terms of endearment commonly used when referring to yours truly. I think I’m going to have to ask Mallory if she knows how to change that. It has been a while since my last blog and I have actually been fishing several times since, twice in the last few days, Saturday and Tuesday,with the mad Englishman or maybe that was a mad dog and an Englishman. Anyway, it was English John and myself. We did both days up on the Peace River and actually did fairly well. Saturday we got into some nice reds, in the 26″ size, and some fairly decent trout with the best being a 24″ fatty. Of course we also caught a few kitties and a ray or two but that’s pretty much a given on the river when you’re fishing shrimp on a jig-head. Tuesday wasn’t quite as good since we caught reds in the rat variety but we bent the rods a lot and actually got into a pile of bait thieving small mangrove snapper. We found them at the San Soucci trestle when we went to reconnoiter the snook situation. Can’t say that we found any snook there but lots of the bait thieves. The water temps are coming up pretty good in the river right now. I was reading 77.8 degrees pretty much everywhere I ran yesterday. Gonna be coming down out of the river early if it keeps going up. I will be hitting the river Saturday in search of that keeper snook since season for them opens then. White bait would be great but I’m not running south to get them. Shrimp on a jig-head and a few old favorite lures will probably be the extent of the arsenal. Might even take along a few freshwater shiners in a bucket. They won’t last long once they hit the saltwater but they only have to last long enough to hook up that keeper snook. Got the butter and lemon pepper ready to go. Good luck everyone. Well, after several weeks of unsuccessful invitations from Frank to get back onto the new blog, I broke down tonight and called Mallory and she filled me in on what to do to get back up and running…we think. Technology is such a wonderful thing, said no person over(well never mind over what age) ever. Frank and I both were stymied even as much as he has learned and does on the computer these days. Thank goodness for young computer literate people, that would be you Mallory. Now for the big acid test, will this actually post? 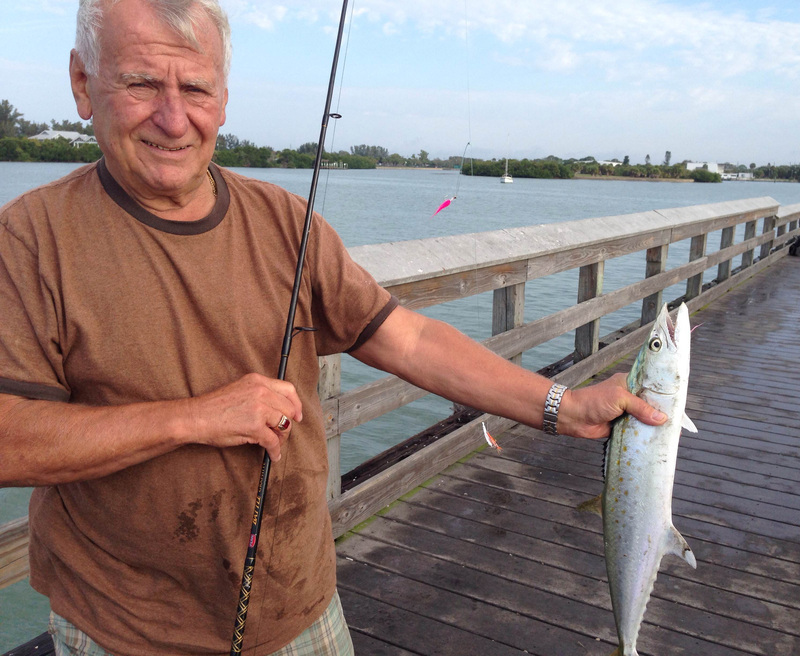 This nice Spanish mackerel was caught on a jig at Placida this morning. Fish this size put up a great fight, and are good eating as well. Ah, yes. You can almost taste that first hint of spring in the air in Southwest Florida. But while springtime fishing hasn’t come full circle yet, it’s time to capitalize on a mixed bag of fish at some of the best transition fishin’ holes in our little corner of paradise. This morning was a perfect example of a transition day at the Placida fishing pier. The late-season sheepshead bite was strong, but the Spanish mackerel stole the show. There were even some jacks, ladyfish and pompano in the mix. The macks were consistent, but mostly tore through the area in waves when anglers would catch them left and right for 5 or 10 minutes before the action slowed down. The Spanish came in all shapes and sizes, but there were some real line-burners landed after screaming-drag battles. The biggest fish I saw was around 28 inches, a quality Spanish by any standards. Spanish mackerel must be a minimum of 12 inches to the fork of the tail to keep, and an angler may keep 15 per day. The most effective technique for the mackerel this morning was live shrimp under a popping cork. Successful anglers were letting the incoming tide carry their baits away from the pier and anchoring them about 20 yards out, waiting on the mack attack. To rig for mackerel under a cork, attach a 3-foot length of 30-pound monofilament and use a long-shank live bait hook, No. 3/0. To anchor the bait in the water, use a splitshot sinker about the size of a pea about 8 inches above the hook. If live bait is not your thing, don’t worry. Mackerel will hit plenty of artificial options. Silly Willy jigs, Gotcha! lures, spoons and soft plastic shrimp imitations on a jig head can also produce plenty of fish. As an added bonus, you can catch pompano on many of the same artificials that mackerel will eat. 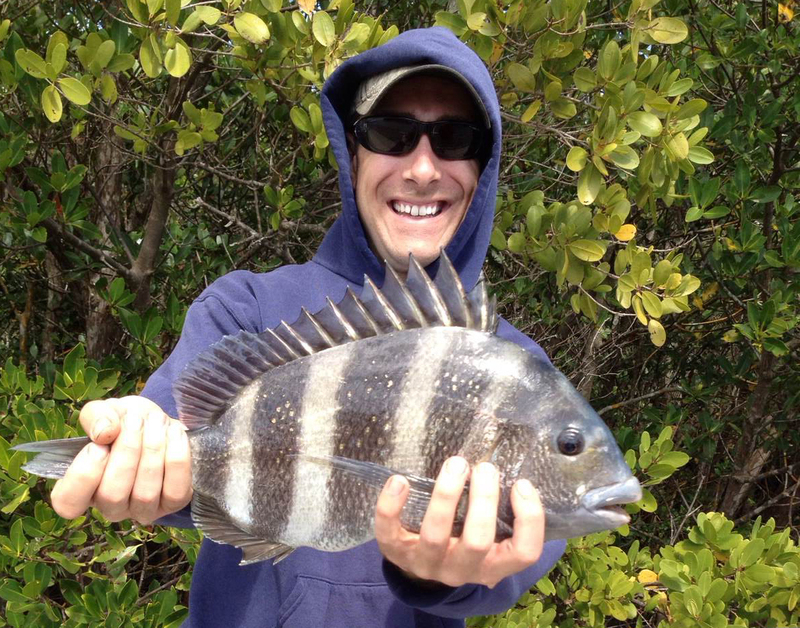 Enough on the mackerel; how about the sheepshead? Having not fished for sheepies at Placida since late January, I wasn’t quite sure what to expect. This is usually the time of year it slows down with the spawn taking place and the majority of fish moving to the nearshore reefs, but the action was good all through the incoming tide. Most of the fish being caught were the smaller males, and this didn’t come as a surprise as a lot of the bigger, breeding-size females have moved on. But there were still plenty of keeper-sized fish and they were eating just about anything. Fish were caught on mud crabs, fiddlers, sand fleas and shrimp. So if you haven’t gotten your fill of sheepshead yet, you better get after ’em before it’s too late! The other area spots that are producing good mixed-bag action are the Venice jetties, L.A. Ainger Pier in Englewood and Boca Grande. 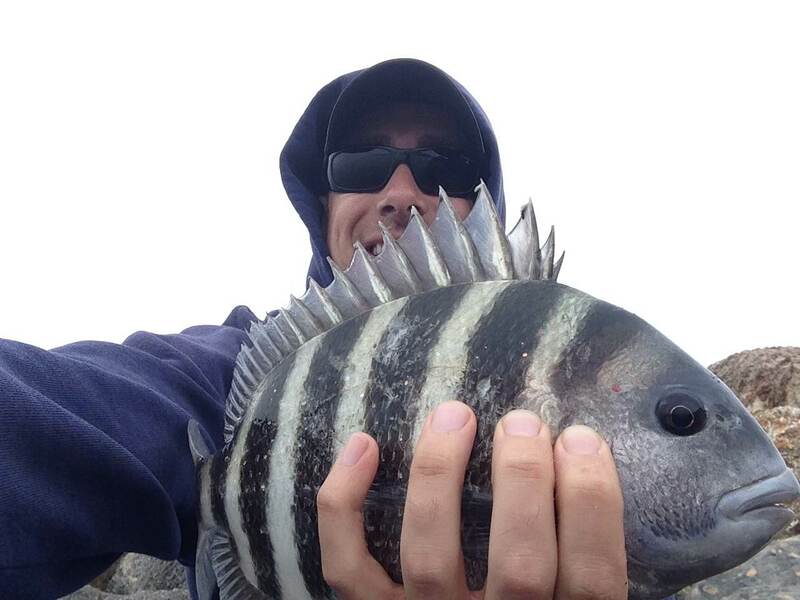 The jetties are your best bet for big sheepshead. And when the pompano show up the jetties can produce an impressive number of fish. Ainger is a classic pompano and mackerel destination, with the bulk of anglers jig fishing. But this pier is also a solid sheepshead hole, and some nice black drum can be caught from the end of the pier casting into the channel. Boca boasts all of the above and abundance of small sharks. If you’re looking for a bonnethead, look no further. Snook season officially opens on the gulf coast on Saturday! The season officially reopens on March 1 in Florida’s Gulf of Mexico state and adjacent federal waters, including Everglades National Park and Monroe County. The season ends April 30th! Thats a nice window of time to catch some great snook! Last fall was my first experience ever catching a snook. I love spending weekends on the local beaches its even better when the fishing is great! We started out in the early morning near stump pass park, just as the fog was disappearing and it was finally warming up. Andrew cast net some live green backs that were swimming around near the shore. The snook around here really seem to love live bait. We go though so many greenbacks here that we usually turn our cooler into a live well using a bait blubber and some frozen water bottles if its a very hot day! Barb gave me this idea when I complained to her we were having trouble keeping the bait alive. Works like a charm and makes them very lively! As you walk down the shore line on an ideal day you will see schools of fish swimming down the beach. I love this type of fishing. Its so exciting to see the fish your trying to catch. The snook here along the beaches range in size from juvenile’s to keeper’s but they are so much fun to catch especially on light tackle! My first keeper was caught on my Fishin Franks rod! Keeper slot is 28- 33 inches. Everyone else must swim away! We freeline bait and use 3/0 circle hooks and 30lb fluoro. I try to cast my bait ahead of the fish im trying to get the attention of. I cast my bait ahead of a swimming snook school and wait, trying to pay attention to where my bait is swimming with out getting too close to the shore line. On a clear day the fish can see you pretty well. Here comes the exciting part! When your snook is checking out your bait and deciding if hes going to eat it or not. It a split second you can watch him eat your bait and create some serious splashing action as hes trying to throw your hook! Im curious this season to try some live shrimp along with the bait we net while were at the beach. I have caught snook on a more blustery wavy day in the surf on a lure. Some days its just difficult to find live bait! I was simply casting down the surf line and using strong action. Lures that resemble green backs or small mullet seem to work the best in this location. The bite for me along the Englewood beaches have been best in early morning to afternoon and right at sunset. This type of fishing is great because its inexpensive and almost anyone can be successful fishing this way even the beginner! Good luck to all the snook fishermen heading out this weekend! 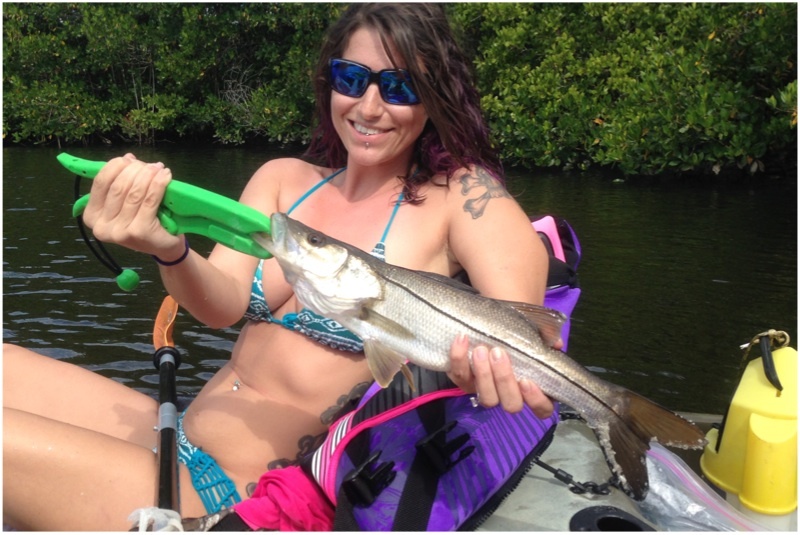 Check out our video below of our fun fall snook fishing along the area beaches! While not as prestigious as Mallory’s first redfish, I was still pretty excited for my first black drum, caught on a live sand flea at Stump Pass beach last weekend. There are certain species of fish that mean a great deal to you when you catch your first one. Some fish, such as cobia for me personally, seem to loom larger than life, consuming your thoughts and fishing trips until you finally land one. Other species just seem to sneak up on you. I can vividly remember my first shark, a 4-foot bull caught at the Gilchrist Park pier in Punta Gorda. Then there was the moment I broke the cobia curse, lucking into a 22-pounder while fishing for trout at the old Bayshore pier in Charlotte Harbor. When I lived on a canal off Edgewater Drive in Port Charlotte, the first redfish I reeled in fell for a MirrOdine 17MR one winter night while I was casting off my dock. While I could go on with tales about goliath grouper, pompano and a host of other species, you get the picture. The anticipation of catching these fish for the first time made the moment when it happened that much more special. But when I caught my first black drum recently, I didn’t even realize it was the first of that species for me until I was holding the fish up for a picture. I had caught it on a live sand flea just moments after my first cast of the day hit the surf. It’s a bit hard to believe, but for all my seven years of saltwater fishing in Southwest Florida I hadn’t caught a black drum until this past Sunday at Stump Pass beach. 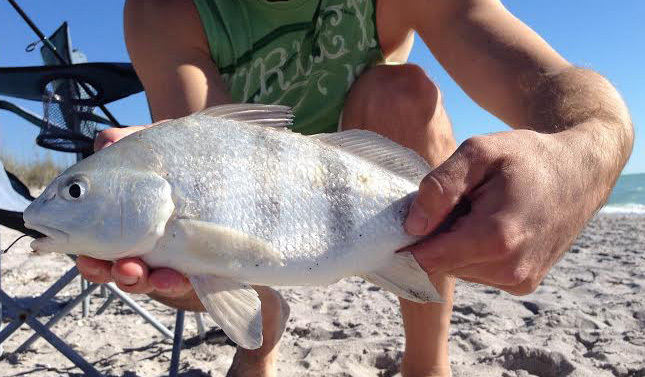 While black drum aren’t exactly a highly sought-after species, they are a pretty regular catch around here. And while I’m pretty sure I’ve hooked and lost a couple big ones fishing the U.S. 41 bridges in Punta Gorda, I had never landed one. This one was just a pup, and at 12 inches was still shy of the minimum length of 14 inches for a keeper. But as I released it back into the surf I was still happy that I could cross black drum off the list of saltwater fish I’ve caught. What species are you hoping to cross off your list this spring? As I was sitting on a rock at the South Venice jetty minding my own business, a guy came down not far from me, but instead of starting to fish he stared at the rig I was using. I was bobber fishing for sheepshead, my favorite way to target them. “Are you using a sinker?” he asked. My only response was to shake my head no. “I don’t fish like that,” he said. Well congratulations, champ. Would you like a cookie? Shortly thereafter, this guy caught a sheepshead. Well, apparently he figured that made him the authority on jetty sheepshead. This must have been at least the millionth fish he’d caught there. What happened next really got my blood boiling. This guy had the nerve to walk over to me and, without any prompting, start offering his two cents on how he thought I should be fishing. This time I didn’t hold my tongue and quickly cut him off. “No offense, but I’ve been fishing the jetties for quite some time, I’m pretty sure I know how to fish them,” I said. Regardless, the guy walked off without saying another word. Here in America, land of the free, a person is entitled to fish any way he wants as long as he’s within the boundaries of the law. It’s a beautiful thing, really. You can be absolutely terrible at fishing, have no clue what you’re doing, and if it makes you happy then that’s the only thing that matters. I love sharing fishing tips and information, but I would never go up to someone on the pier and tell them what they’re “doing wrong.” They’re free to fish however they want. If, however, someone asks my opinion on how to do something I’ll happily give them my advice. This guy had no clue who I was, how many fish I had caught that day or how long I’d been fishing in that spot the way I was fishing. So keep that in mind before you approach someone and start offering your advice. If you’re catching fish on the pier chances are good people are going to notice and someone will probably ask you how you’re catching them. And guess what? That’s a great time to share your secret with them. Because, really, there are no “secrets” left in fishing, just like there are no “secret spots.” Why not pass along your technique and help someone else catch a fish? Then you can both enjoy it. That’s my two cents on the matter. I hope you got your money’s worth! Today we wanted to head out to enjoy the beautiful weather but we also wanted to hide from the wind! Winter time in Florida has been beautiful this year, the canal systems are great for enjoying the winter months in your boat or kayak! They tend to be calmer waters, and fill up with hungry fish in the cooler months. My friend lives on a local canal and let us launch from his place today! He knew of a spot of mangroves not too far from his house that we could explore. Today I really wanted to catch my first redfish. Bait today was live shrimp, and gulp! When we started out the morning didn’t look too promising, cold foggy and overcast! I was just hoping the rain would stay away since there were scattered showers in the area! As we headed out of the canal I was casting some gulp and was quickly hooked up on a lady fish! These are a blast to catch and always like to put on a show! I thought about keeping it for bait but I had enough already, next time I would love to try a lady fish as cut bait under the mangroves. We arrived to a small island of mangroves as the sun was finally coming out for the day! Things were looking up, after we paddled against the tide and the wind we found ourselves in very calm waters sheltered by the mangroves. We could see some bait up in the shallows and thought this would be a pretty great place to start fishing. Andrew and I switched to live shrimp and drifted up and down the shore line throwing our shrimp as far under as we could cast! The fish were pretty active and Andrew almost caught a redfish, the target species of the day, only to be broken off almost as quickly as the bite happened. Mr redfish knew just where to hide to get away from us! 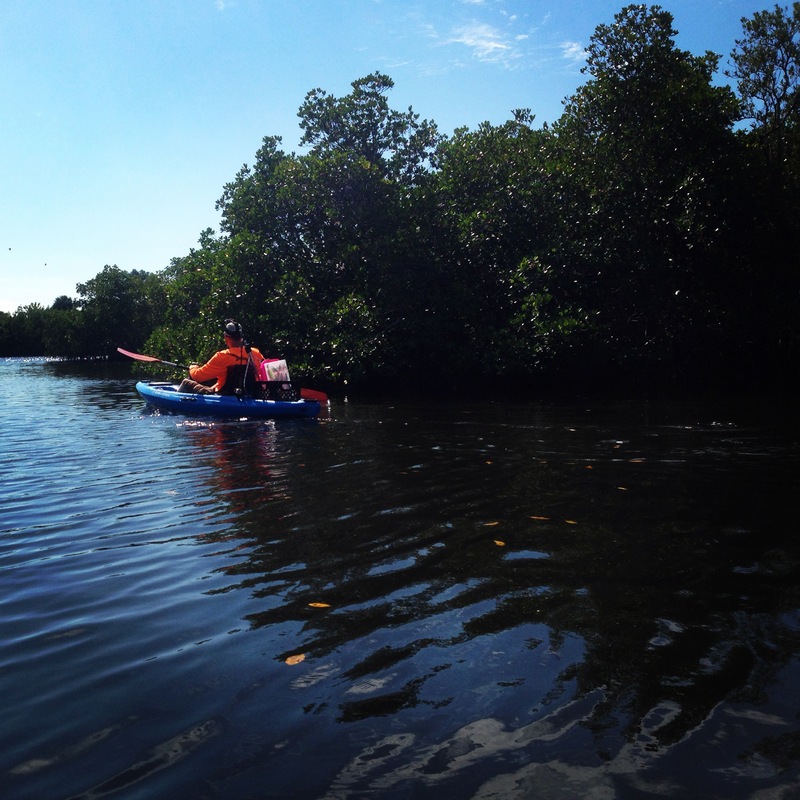 We paddled deeper into the mangroves over some beautiful flats. Lots of sheepshead swimming around and an abundance of sea stars & crabs at this location. We once again re baited our hooks and started throwing our baits up under the mangroves as we enjoyed the afternoon sun! It was warming up very quickly by around noon. The wind was picking up and we started drifting a lot faster than before, I set my rod in my lap to paddle out of some trees I was quickly drifting into when my bait got picked up! This fish took a ton of drag on the new Shimano Symetre. The reel was awesome and handled the fish well, snook are one of my favorite on light tackle. We paired it with a Teramar rod 10lb invisa-braid to a 20lb fluoro leader to a 2/0 owner live bait hook. This combo can be found at Fishin Franks! Once I was able to get him away from the mangroves I realized had a juvenile snook! Very healthy, you could tell he’s been eating well. Snook season opens March 1st for those of us on the gulf side of Florida! 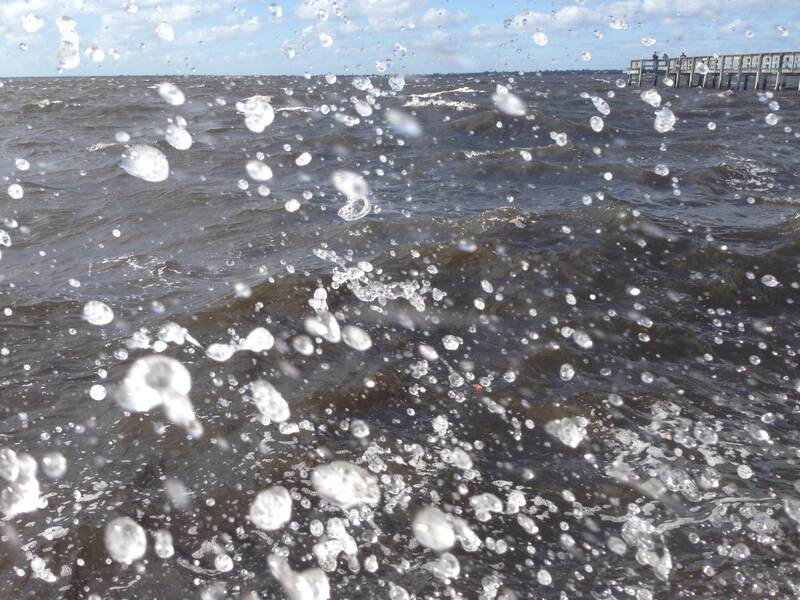 The howling wind that churned up Charlotte Harbor on Thursday seemed to help my cause, while Friday’s picture-perfect weather hindered it. 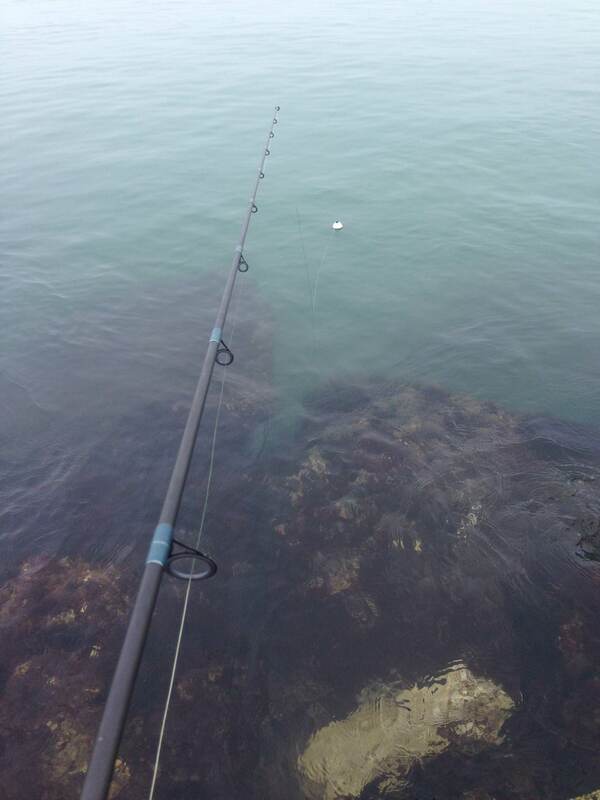 Fishing is fickle, plain and simple. One day you’re catching fish after fish and can hardly keep a bait in the water. The next day, you might as well be wetting a line in the bathtub. That night-and-day scenario is part of what makes fishing challenging, and keeps anglers guessing. Thursday was a solid day for sheepshead at Ponce de Leon Park in Punta Gorda despite the 25-mph wind that blew consistently all day. But it was actually the wind that helped create ideal conditions, not destroy them. The wind turned the Harbor water quite murky, and visibility was low. This helped me catch the sheepshead that were hanging out close to the pier, as the murky water kept me and my tackle hidden from the fish. After the cold front passed through Thursday night, Friday morning dawned clear, calm, cold and sunny. The tide was incoming just like it had been the day before. 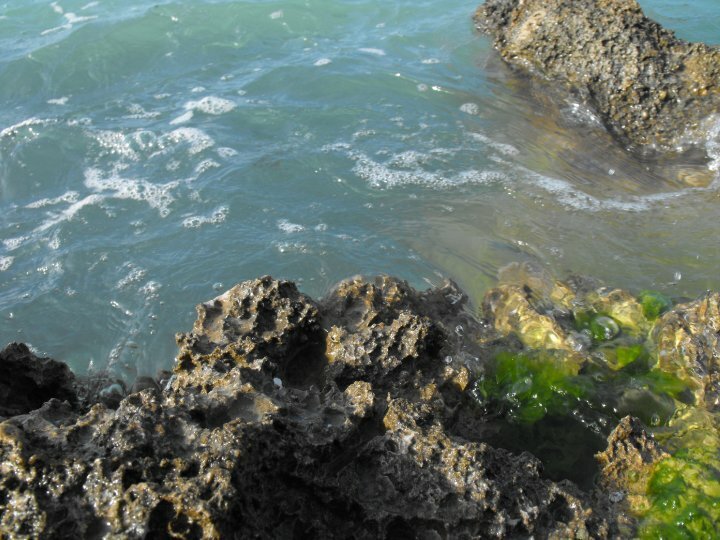 But without the wind churning up the Harbor, the water at Ponce was clear and visibility was high. I could see dozens of sheepshead – some were absolute brutes – but that was the problem. You see them, they see you. Spooky fish tend to turn their noses up at just about everything, and that was the case this morning. Even after scaling back my tackle, switching to a fluorocarbon leader and casting out further from the pier, the fish still wouldn’t touch a live fiddler crab, something they had been eager to eat the previous day. But there could have been other factors at play as well. With the full moon coming up Saturday, the fish could simply have stopped biting. Or, they might have been more interested in each other – do fish celebrate Valentine’s Day? – the spawn should be starting very soon. As fishermen we will always create endless scenarios in our heads for why the fish wouldn’t bite. The only one who really knows is Mother Nature, and she ain’t sharing. Regardless, I didn’t catch anything. Thankfully I had a big fillet left over from the previous day’s fishing to eat for lunch. There are some big sheepshead around the pier right now at Ponce de Leon Park in Punta Gorda. This bruiser fell for a live fiddler crab. Sometimes the best option for a fishing hole is the one that provides the most cover – for you, not the fish. The wind was whistling out of the northwest with enough force (gusts to 30 mph) to create white caps on Charlotte Harbor this morning, not exactly prime fishing conditions. And while only the adventurous anglers left the docks this morning to battle the waves in boats, I headed for a spot that was mostly protected from the wind where I was pretty sure the sheepshead would be. My decision paid off with one of my biggest sheepies of the season. The pier – there are actually two small ones – at Ponce de Leon Park in Punta Gorda is a place that I haven’t fished that much. But it’s a good spot for a couple reasons. First, it’s the mouth of the Punta Gorda canal system, a natural highway for many species of fish. This time of year, most of the sheepshead are getting ready to leave the canals if they haven’t already. Some are still heading in, especially on a strong incoming tide like we had this morning. So the pier provides cover for the fish moving in and out of the canals, making it a prime spot to hook one. Another reason I like Ponce is the availability of bait in the area. There are thousands of fiddler crabs that make their burrows in the sand and around the mangroves. While it’s hard to find the fiddlers in large groups, you can pick off individuals pretty quickly if you have a little stealth and speed. Or you can ambush them in their burrows, digging them out with a spade or small shovel. 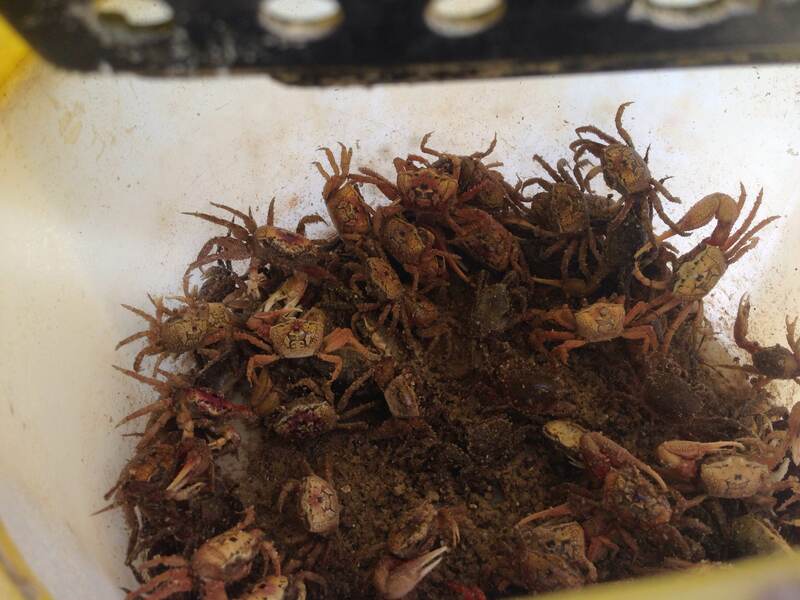 There are wharf crabs mixed in with the fiddlers, and they also make great sheepshead bait. But the reason I chose Ponce today was a simple one: protection from the wind. The mangroves lining both sides of the canal provided ample cover from the relentless gusts. The piers are a bit uncomfortable for the style of sheepshead fishing I like, and leaning up against the metal railings doesn’t lend itself to that style like the wooden railings at piers like Placida, Boca and El Jobean. It’s also harder to fish directly by the pilings, and the water isn’t that deep next to them. But with a little adjustment to technique you can surely catch some fish, and there are some big ones passing through the area right now. My first cast just a couple feet out from the pier – the depth drops off rapidly – yielded a keeper that chomped on the live fiddler I offered it. After an hour or two and some smaller fish, I found what I had been looking for, a fish the size that I’d been hearing about anglers catching at Ponce. This fish was a bruiser, all of 4 pounds and 17 inches long. It put up a nice little fight and I was lucky enough to hoist it over the railing, and the hook popped out of its mouth as soon as I did. Use a standard sheepshead rig to fish Ponce by attaching a 1-ounce egg sinker to your main line, then tying on a swivel below it. Attach 2 feet of 30-pound monofilament for your leader, a No. 2 Owner Live Bait Cutting Point hook and a tiny splitshot (optional) 6 inches above the hook. There are plenty of fish right by the pier, but you can also try casting out into the channel as well. This should give you a good idea on how to use the bobber method the late Mr. Sheepshead, Dave Hack, perfected at the Venice jetties. One of the most frustrating feelings in fishing is being able to see fish but not being able to catch them. As I watched from my perch on a rock at the South Venice Jetty recently, dozens of sheepshead, some as big as 20 inches, darted around the rocks below in plain sight. The water was super clear, especially on the Gulf of Mexico side, and I could easily see down 5- to 8-feet. I usually tend to fish the inlet side of the jetties for sheepshead but they have not seemed to be hanging out there as much this season. While contemplating how to get the fish to bite I happened to glance at my rig, and that’s when the little light bulb in my brain popped on. The standard rig I use at the jetties is a 3-foot length of 25-pound fluorocarbon with a No. 2 hook, and a splitshot attached about 6 inches above the hook. But it was the splitshot that caught my attention. In murkier water I wouldn’t have given it a second thought, but in the clean jetty water I figured it was sticking out like a sore thumb. I removed it and slid my bobber even further up on the main line, leaving about 4- to 5-feet of line between it and the hook. That seemed to do the trick, as I hoisted my first keeper up onto the rocks just a few minutes later. Even the miniscule weight of the live sand fleas I was using as bait was enough to sink down to a depth in the water column where the fish are. And often the bite came as the bait was falling, allowing me the seldom seen pleasure of actually watching the fish take my bait. There are not many instances when you can watch a sheepshead take your offering. I’ve stopped using the splitshot on jetty sheepshead rigs unless absolutely necessary. The current doesn’t pull nearly as strong on the Gulf side, so if the fish are biting there it’s much easier to pursue them. The trick is to find a large slab of rock that juts out several feet into the water, then to find a suitable rock to stand on and fish from directly in front it. Once you find one of these spots you’ll know exactly what I’m talking about. Fishing from one of these perches makes it easy to keep your bait in the strike zone. Using a bobber makes things even easier. A small bobber keeps your bait suspended above the rocks and at eye level with the fish. You’ll have to adjust your depth by sliding the bobber up or down your line until you find the magic depth, but once you do you’ll be able to hone in on the fish. This takes away the tiresome aspect of holding out your arm and trying to keep your bait as close to the strike zone as possible. It takes a little getting used to when employing the bobber method, but once you master it you’ll hardly ever get hung up on the rocks. Just keep a close eye on the bobber and learn to read the telltale – and often very subtle – signs of the sheepshead bite. 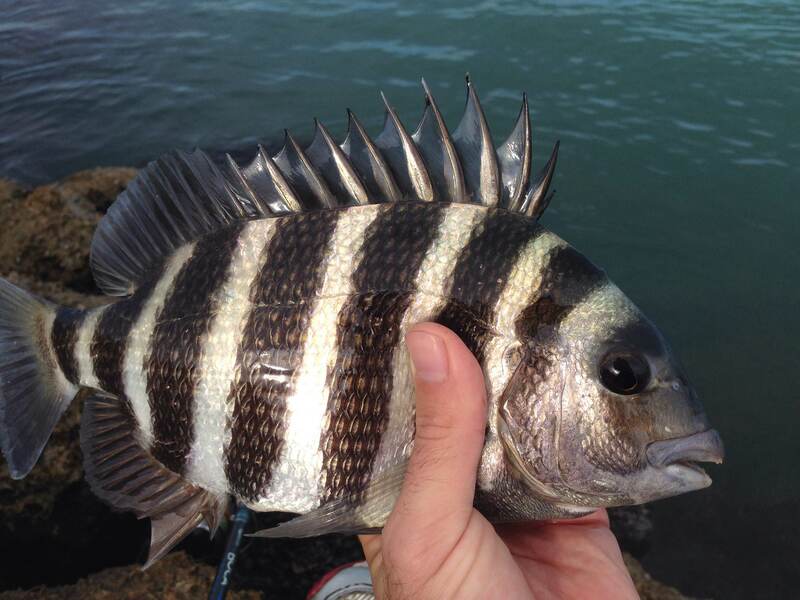 The sheepshead action at the jetties isn’t quite up to par with what has been one of the best late-season spots in Southwest Florida. February is usually the month the sheepshead are stacked up and biting hard. That being said, there are still a good number of fish being caught so if you’re after some keepers it’s still a solid spot. A lot of the fish have been the cookie-cutter 12-inch males, but if you’re handy with a fillet knife that shouldn’t matter much to you. Live sand fleas or fiddler crabs are your best bet for bait. If you want to rake your own fleas try the municipal beach right near the south jetty.